I have to tell you, I do not bake with berries nearly often enough. Every time I do, I can’t believe I don’t bake with berries more often, and I give myself a little kick. It seems like every berry recipe I try turns out wonderfully, but they are so short lived during the summer season that I tend to turn more towards flavours that are readily available year round, like chocolate or peanut butter. 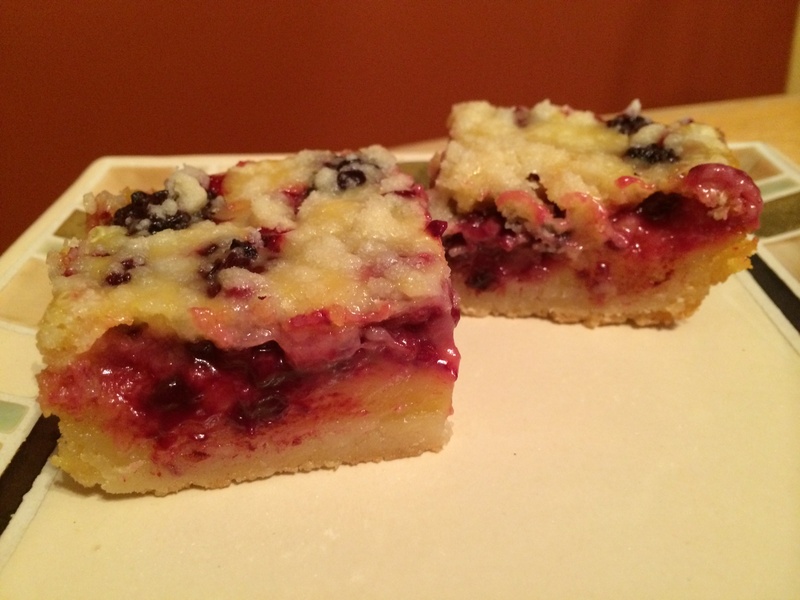 Still, if you like raspberries, and if you like lemons or lemonade, go make these. Ahh! A beautiful, thick shortbread-esque crust, topped with a tangy, sweet, and tart filling. The beauty of this dessert, despite being berry season, is that it calls for frozen raspberries, so it can be made any time of the year. One of the wonderful things about berries is that they freeze so well. They keep all those marvelous juices locked up inside, and still release them when thawed or cooked. Now, I will let you all know. Paul and I just moved into a new house. The oven and I are still on fairly new terms, and I am still figuring out how temperamental (haha… I hope I’m not the only one who had a giggle!) the oven is. After baking these, I am inclined to think this oven actually runs a bit on the cool side, as I had to bake these bars for about 12 minutes longer than the listed baking time. Still, I find when you bake, always set your timer for the lesser time, and start regularly checking your baking about 10-15 minutes before it is supposed to be done. Every oven is different, and it’s better to check early than to check too late and end up with burned baking! I will also let you know, this makes a full 9 x 13 pan. You can always halve the recipe if you want. For me, bigger is better! (Which also means more treats for Paul and I to indulge in!) Because of my oven, I found that the bars along the edges of my pan solidified a bit more during the cooking process, while the bars in the middle of the pan were just set and still juicy. In my mind, not a bad thing! Some people prefer different textures, and my result would have pleased either or. But, with all things said and done, I was extremely pleased with these bars. Both textures tasted delicious, and the colour was quite bright (my pictures don’t do them justice). 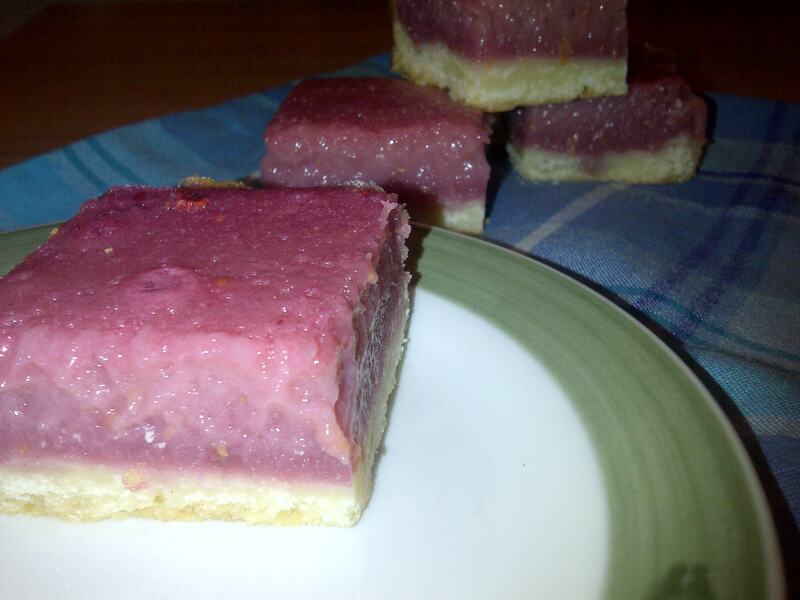 Again, if you are a fan of raspberries or lemonade, try these bars. You won’t be disappointed! Preheat the oven to 350° F. Line a 9 x 13 pan with parchment paper. In the bowl of an electric mixer, combine the butter and sugar. Beat on medium-high speed until smooth, 1-2 minutes. With mixer on low speed, mix in the flour and salt until just incorporated. Add the dough to the prepared baking pan, and press into an even layer over the bottom of the pan. Bake for about 25 minutes, or until light golden brown. Remove from oven, placing on a wire rack to cool. Leave oven at 350°. While crust is baking, make the top layer. Combine the sugar, flour, lemon zest, and salt in a large bowl and whisk to blend. Add the egg whites and eggs to bowl to the dry ingredients and whisk well to blend. Add the raspberries to a fine mesh sieve and press through, mashing with a spatula, to extract as much juice and pulp as possible, straining out the seeds. 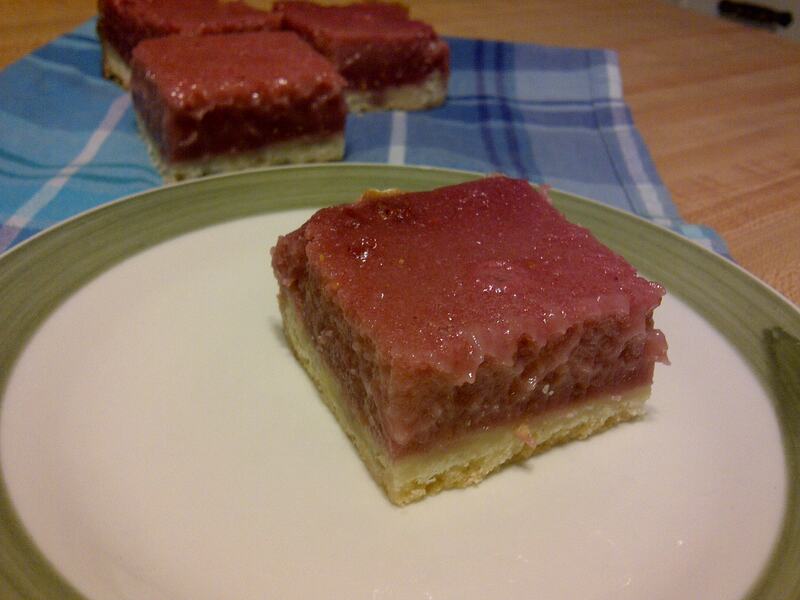 Whisk in the raspberry puree and lemon juice until smooth. Pour the filling mixture over the crust and bake until the centre is just set and no longer jiggles when gently shaken, about 35-40 minutes. Transfer to a wire rack and cool to room temperature. Once at room temperature, chill well in the fridge, at least 2 hours. When ready to serve, use the parchment paper to lift the bars from the pan. 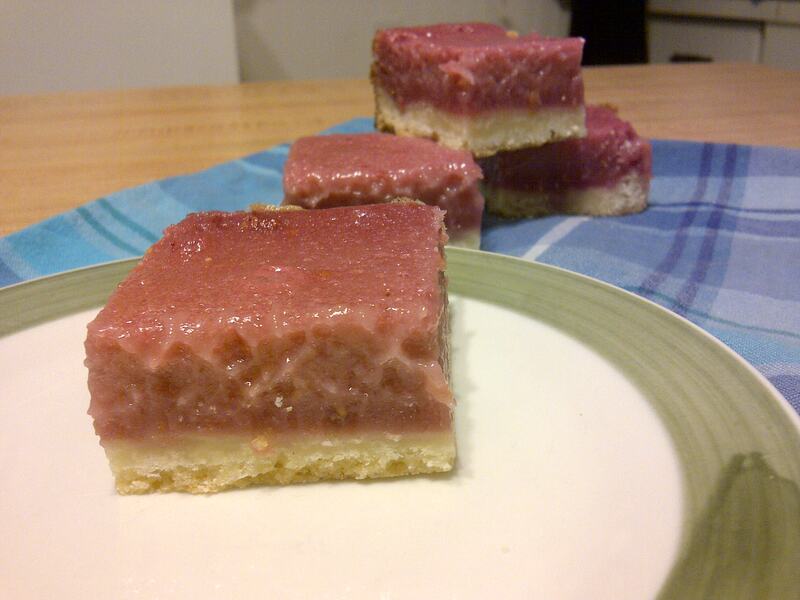 Place on a cutting board and slice into bars. Dust the tops of bars with icing sugar if desired. Can I just stop for a minute and tell you how much I love blackberries? I was born on Vancouver Island, British Columbia, and I have to say, one of my favourite early memories is going outside to our backyard, picking fresh blackberries right off the bushes on our property, and then taking them to my dad, who would make an amazing blackberry pie. (My mom always cooked and baked for us as well, but when it came to blackberry pie, my dad was the hands-down winner every time.) Oh, blackberry pie. One of my favourite desserts. Now, a wonderful friend of mine commissioned me to make a selection of desserts, and, it being June, berries and baking are on my mind. Ever since seeing this recipe on Annie’s Eats, I knew I had to try it. Blackberries? Yes. Pie? Please. Bars? Love them. Finally, finally I had a chance to try this recipe out. Let me say, it did not disappoint me. Annie knows her baked goods. The crust is beautiful and buttery and crumbly deliciousness all rolled up into one. The filling is perfectly juicy, sweet, and tart, just like a blackberry should be. Finally, there is a wonderful lemony flavour that complements the blackberries so well. 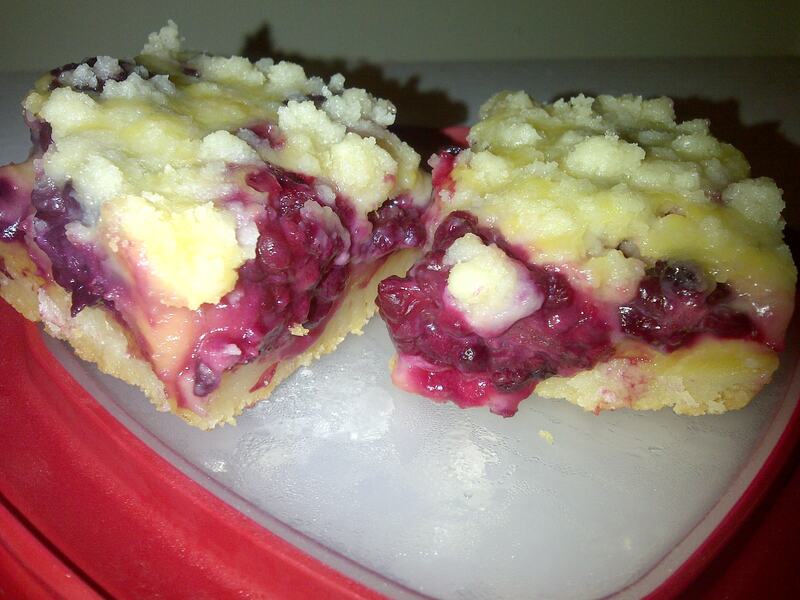 If you are a lover of blackberries, do yourself a favour and make these sometime soon. Preheat the oven to 350˚F. Line a 8 x 8 inch or 9 x 9-inch baking pan with foil and grease lightly. In a large bowl, combine the flour, sugar, salt and lemon zest. Toss with a fork to combine. Cut the butter into small cubes, then add to the bowl with the dry ingredients. With a pastry cutter (or two forks and your hands if you do not have a pastry cutter) cut the butter into the dry ingredients until only small pieces of butter remain and the mixture is crumbly. Reserve ¾ cup of the mixture for topping the bars. Add the rest of the mixture to the prepared pan and press to form an even layer of crust on the bottom of the pan. Bake 12-15 minutes, until light golden. Let cool 10-15 minutes. After crust has cooled, in a medium bowl, make the filling mixture. Combine the eggs, sugar, sour cream, flour, salt, lemon juice and vanilla. Whisk until smooth. Gently stir in the blackberries with a spatula. Spread the filling mixture over the pre-baked crust in the baking pan. Crumble the reserved topping mixture over the filling evenly. Bake until the top is beginning to brown and the bars are just set, about 45 minutes. Let cool completely on a wire rack. Chill to firm up before slicing and serving.